"There is no barrier in life"
Three-time Paralympic gold medallist, Michael McKillop, has never let his disability stop him from achieving his dreams. Michael and coach, and father, Paddy McKillop, talk about how sport has always been a positive influence on Michael's life. "There's no barrier in life. 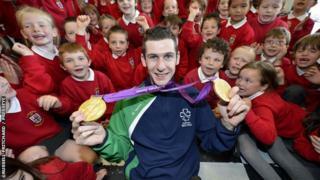 The only barrier is a bad attitude" says McKillop. "Believing in yourself, you can achieve whatever you want to do."